Tonal cream is designed to smooth out complexion and mask small flaws. Professional make-up artists proclaim this tool as the basis for make-up. After all, thanks to him, the skin acquires a beautiful even shade. Tonal cream, soap, water, facial cleansers, light face cream, napkins. Choose a foundation for your skin type. For oily skin is suitable liquid foundation. It is sold in a glass jar or vial. This cream absorbs excess sebum. Therefore, the skin for a long time remains smooth and matte. The composition of creams for oily skin includes extracts of quince and licorice root. If the skin is inflamed, has a lot of open pores and acne, use a tonal compact powder. It covers the skin with a denser layer. The cream spreads evenly on the skin, not accumulating at open pores. As a result, the face acquires a healthy appearance. The composition of this powder includes antiseptic substances that promote the healing of acne. For dry and sensitive skin, choose a normal water-based foundation with various vitamin supplements. The shade of the face, of course, is also important. Therefore, while in the store, ask the consultant for a sample of the remedy to apply it to the back of the hand or to the nose. Choose a cream in daylight. For light skin, light shades will suit, and for dark skin – dark. A good foundation is always adjusted to the complexion, as if merging with it into one. Note that the foundation should not be noticeable on the skin. For the evening time of the day, select a remedy that will be darker than your natural face tone. If the cream is applied to the face, wait 10 minutes. Practically in all cases, the foundation has a little darkening property. Before applying a foundation, wash with soap and various cleansers. After that, apply a very light moisturizing cream on your face. Let it absorb well into the skin. Walk on the face with a paper napkin to remove the remnants of the cream. Apply toner on your face with a thin layer. Move strictly on the massage lines: so you will not stretch the skin of the face. In the area around the eyes, the cream should not be stretched over the skin, but be driven with pads of fingers. Never apply the cream in the direction from the periphery to the center of the face: this will make the wrinkles and pores even more noticeable. That the paint was distributed evenly, use the cream in small portions. Compact the powder with a sponge or brush. Just gently rub the cream into the skin. This method of application is recommended by professional make-up artists. With the help of it you can achieve an amazingly natural result. 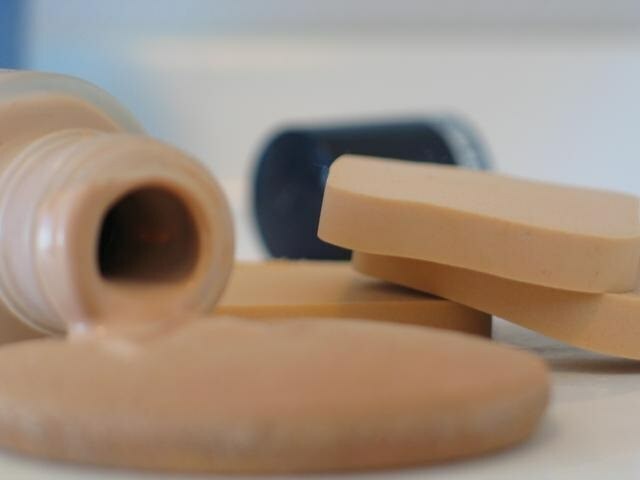 The best sponge for tonal creams are made from natural rubber. They have a fine porous structure. Sponge with large pores absorbs too much cream, so makes it difficult to apply. Each time after use, rinse the sponge with warm water and dry it. So you prevent the appearance of microbes on it. To makeup did not look artificially, mix the same amount of tonal and day cream on the palms and apply on the face. So you can create a very natural effect, because the skin will get a beautiful and even shine. If the shade of the foundation appears to be too dark, also practice mixing with a normal day cream for a face in a one to one ratio. To mask the red spots there are special creams with a green tint. Apply such a thin layer and gently drive into the skin. Visually green neutralizes red. After such a cream, powder is applied to the necessary places. Therefore, reddening as if disappear. To mask the bags under the eyes, it is customary to use a yellow-colored foundation. Because the yellow color neutralizes the violet circles.